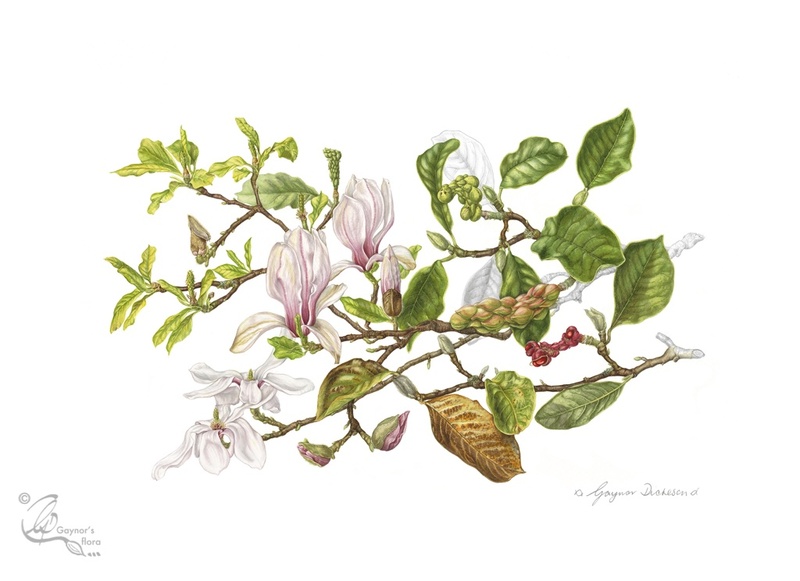 Although I had won awards for other artwork before, this picture, a part of the Magnolia x soulangeana series of pictures, was the one that made me feel I was getting ‘there’ in botanical art. It was a mega piece of work done over three years. We have the tree in our garden and as the seasons changed I added another piece to the picture, making sure it all came together properly in the last year. Funnily enough, whilst I was painting different elements from the tree, it had some very large fruit on it. Nothing like these have graced the tree since. Perhaps it really liked its portrait being painted. Have a look on the Portfolio page, where you can see the whole series. Silver gilt medal for ‘ Small is beautiful’ crabapple series. Chairman’s award highly commended for Magnolia x soulangeana: Bloom and Dissection. Silver Grenfell medal for the series ‘A year in the life of a Magnolia x soulangeana tree’. Silver Gilt Botalia medal for the series ‘A year in the life of a Magnolia x soulangeana tree’. Certificate of botanical merit for ‘The Bosham Hoe Celariac’. Distinction for the Distant Learning Course. Private collections in Australia, Italy, Netherlands, Norway, USA and UK. Hello Gaynor, I find your work fascinating and wondered if you have a space for the weekly class in September? Although a novice I would enjoy learning some of the techniques involved to produce such beautiful work. Hei Davina, thank you for your kind words. I am glad that you would like to know more about the techniques I use, but unfortunately the weekly class is full. I can put you on the waiting list though. My next workshop is Fruit and veg. 18-19 August and there is a place for you if you want to take it. Because of workshops abroad, I only have one more in Bosham in November and this will be autumn leaves on vellum. Do get in touch via my email address gaynorsflora@mac.com.